From Conquest to Conservation is a visionary new work from three of the nation’s most knowledgeable experts on public lands. As chief of the Forest Service, Mike Dombeck became a lightning rod for public debate over issues such as the management of old-growth forests and protecting roadless areas. Dombeck also directed the Bureau of Land Management from 1994 to 1997 and is the only person ever to have led the two largest land management agencies in the United States. Chris Wood and Jack Williams have similarly spent their careers working to steward public resources, and the authors bring unparalleled insight into the challenges facing public lands and how those challenges can be met. Here, they examine the history of public lands in the United States and consider the most pressing environmental and social problems facing public lands. Drawing heavily on fellow Forest Service employee Aldo Leopold’s land ethic, they offer specific suggestions for new directions in policy and management that can help maintain and restore the health, diversity, and productivity of public land and water resources, both now and into the future. Also featured are lyrical and heartfelt essays from leading writers, thinkers, and scientists— including Bruce Babbitt, Rick Bass, Patricia Nelson Limerick, and Gaylord Nelson—about the importance of public lands and the threats to them, along with original drawings by William Millonig. 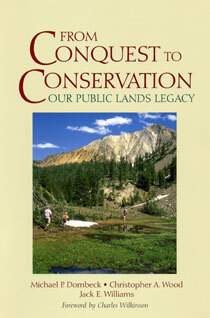 From Conquest to Conservation was a finalist in the 2004 Benjamin Franklin Award's Science/Environment category.